Where seen? 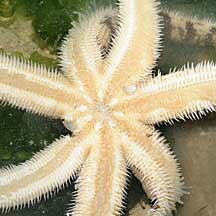 This elegant and active sea star is sometimes seen on our Northern shores, on soft, silty shores, near seagrass meadows and coral rubble. 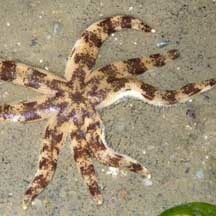 It is usually seen alone, and not in large groups. It moves rapidly and is usually more active at night. Features: Diameter with arms to 12-20cm. 5 to 9, usually 8 arms. The arms are long, somewhat rounded in cross-section, and tapered to a sharp tip, edged with small sharp spines along the sides. 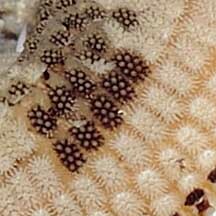 The upper surface of the body is covered with special flat-topped, pillar-like structures called paxillae. 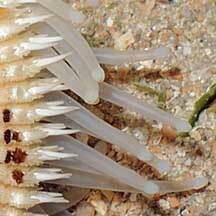 The underside is pale, and from grooves along the arms emerge large tube feet with club-like, pointed tips. 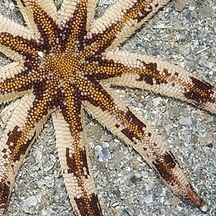 Colours and patterns on the upperside are highly variable in shades of greyish blue, to brown and beige, but usually with a darker star-shaped pattern in the centre, and dark irregular bars along the length of the arms. 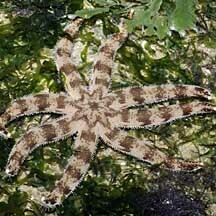 Sometimes mistaken for the Common sea star (Archaster typicus). 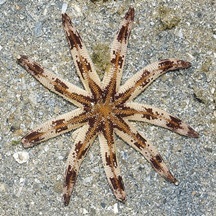 The Common sea star has large tube feet with sucker-shaped tips, while the Eight-armed sand star has large tube feet with pointed tips. What does it eat? According to Lane, it burrows in soft sediments and feeds on small buried animals such as molluscs and other echinoderms. 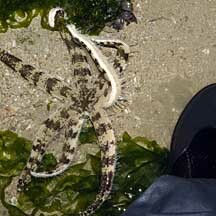 Coleman has a photo of this sea star eating another sea star! 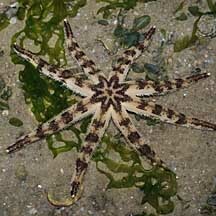 Status and threats: According to Lane, the Eight-armed sand star used to be common on our mainland shores. 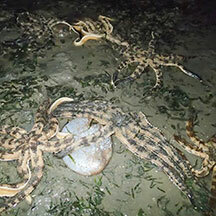 It is now listed as 'Endangered' on the Red List of threatened animals in Singapore. 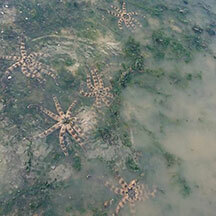 It was formerly found near the mainland prior to reclamation but recently known only from the Pulau Ubin and Pulau Tekong area in low numbers. A huge one bigger than my foot! Flat-topped, pillar-like structures called paxillae. Close up of the mouth. 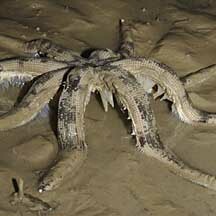 Cluster of many large sea stars. Shared by Carol Phillips on facebook. Shared by Richard Kuah on facebook. Learning about Luidia! 5 Things about The OTHER Sand Star! 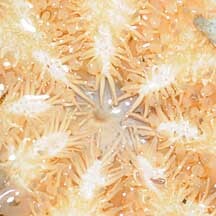 by Dr Christopher Mah on Echinoblog. Coleman, Neville. 2007. 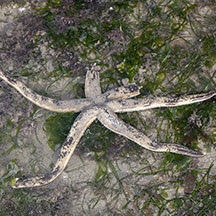 Sea stars: Echinoderms of Asia/Indo-Pacific. Neville Coleman's Underwater Geographic Pty Ltd, Australia.136pp.